Wind power is a variable power source, dependent on weather conditions. Electric grid operators keep the grid stable by balancing the variable amount of power produced from wind farms by increasing or decreasing power production from conventional generation stations, including coal and natural gas. 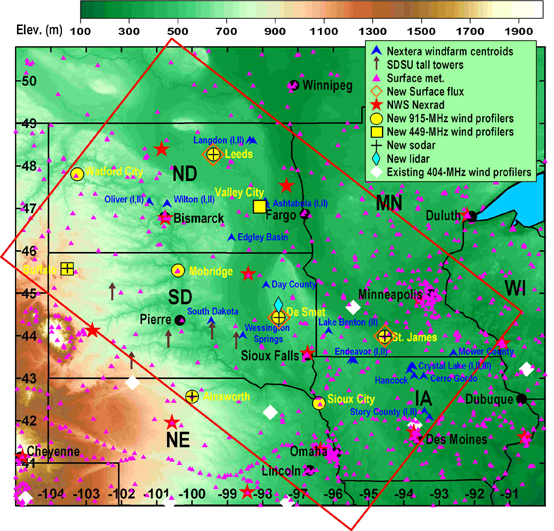 Having advance knowledge of when wind power will ramp up or down through accurate weather forecasts can lead to significant improvements in the efficiency of operation of these fossil fuel plants, as well as the entire electrical grid system, resulting in lower costs as well as lower CO2 emissions. Lowering the costs of integrating wind energy onto the grid will accelerate the development of wind energy as a growing component of the nation's energy portfolio. Base map of the northern Great Plains study area showing existing and planned new observation locations. Tall towers shown are from the public South Dakota State University network. Proprietary tall tower locations are not shown. Base map of the southern Great Plains study area showing existing and planned new observation locations. 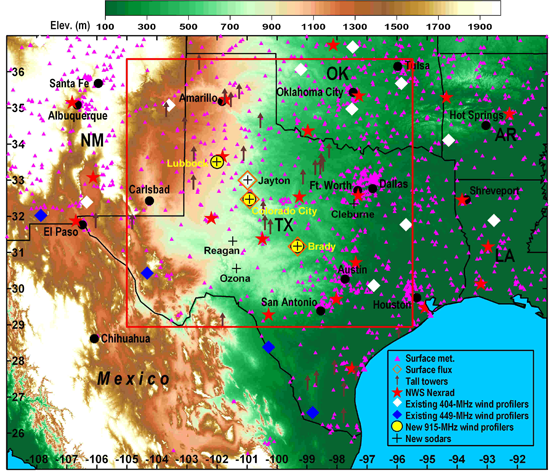 Tall towers shown are from the public West Texas tall tower network. Proprietary tall tower locations are not shown. Two private sector groups were selected by DOE to partner with DOE and NOAA on WFIP, and therefore two geographic regions will be studied. The first private sector group is led by WindLogics, and will cover the northern Great Plains region. The second private sector group is led by AWS Truepower, and will cover an area of the southern Great Plains centered on west Texas. The instruments deployed in the two study areas are shown in the figures above. WFIP will span one full year of data collection, forecasting and economic evaluation, with an anticipated start date of July 2011. Links to public model evaluation web pages for the northern and southern study domains can be found at the top of this page.